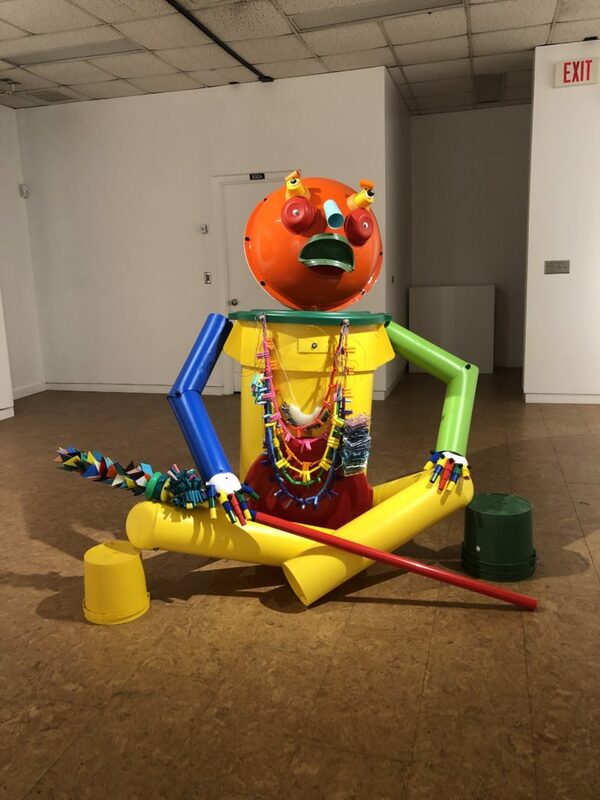 As a long-time knitting hobbyist, I was excited to see the UMKC Gallery of Art hosting Matter Matters, a show curated by Davin Watne and featuring the work of Karolina Gnatowski, Dan Gunn, Noel Morical, and Alex Lockwood. Having mistaken the show for an exhibition of fiber art, I was happy to find fabric, wood, plastic, lottery tickets and even bullet casings creating a primer in the gestalt potential of tapestry. Matter Matters communicates the ways that individual units can work with and between one another to convey moods and messages vastly different from the materials’ original intent. It digs into the many lives objects can lead, affecting us and the world we inhabit in profound and sometimes terrifying ways. 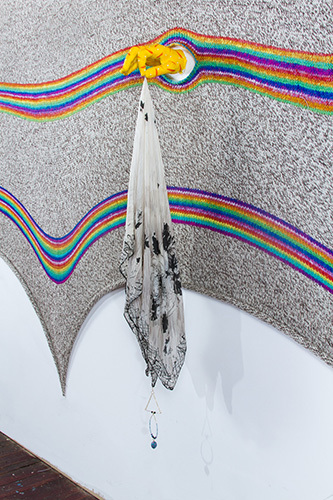 Karolina Gnatowski’s giant knit tapestries were the first pieces to catch my eye. 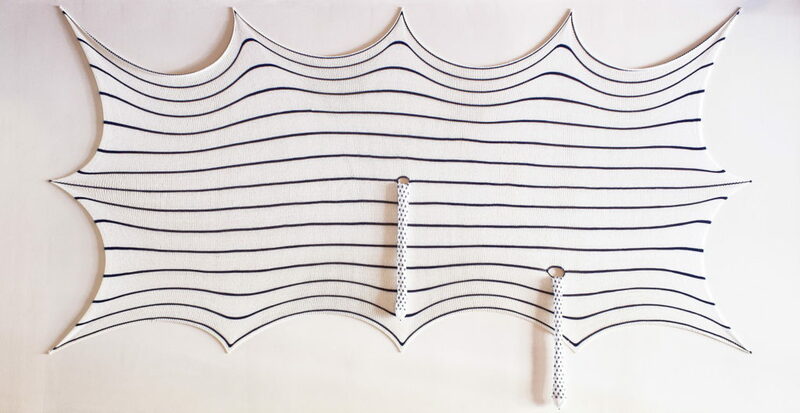 Gnatowski stretches large swaths of often striped knit fabric to create curvilinear patterns, laying bare the work that goes into creating even a basic knit stitch (let alone stripes, cabling, etc.). Their pieces hold strange and surprising artifacts: a patterned hand holding a lacy shroud from which a piece of jewelry dangles, two swaths of fabric that might be stockings. These insertions — or extrusions, rather — seem to suggest something more going on behind the surface of the pieces, a life being lived in these hanging garments. To me they also convey the quiet grace of domestic labor. Knitting seems like the ultimate symbol of women’s work: stitch after uniform stitch woven dutifully together to create something functional. 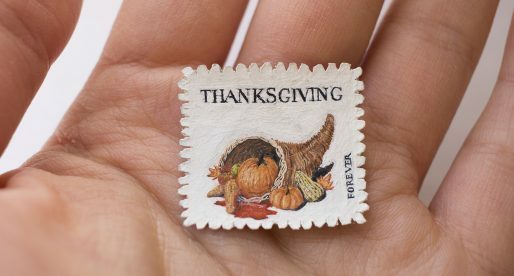 The socks that wear holes and then are darned and replaced, the hat that gets lost after one season, the sweater layered between shirts and coats. By stretching these knit items out, interspersing them with adornment and laying bare the complexities of their construction, we remove them from the world of mere function. It is then that we can view them for their formal and aesthetic qualities. In Gnatowski’s pieces, the cloth wears the person. Hidden among Gnatowski’s splashier works is a small piece called piLLow. 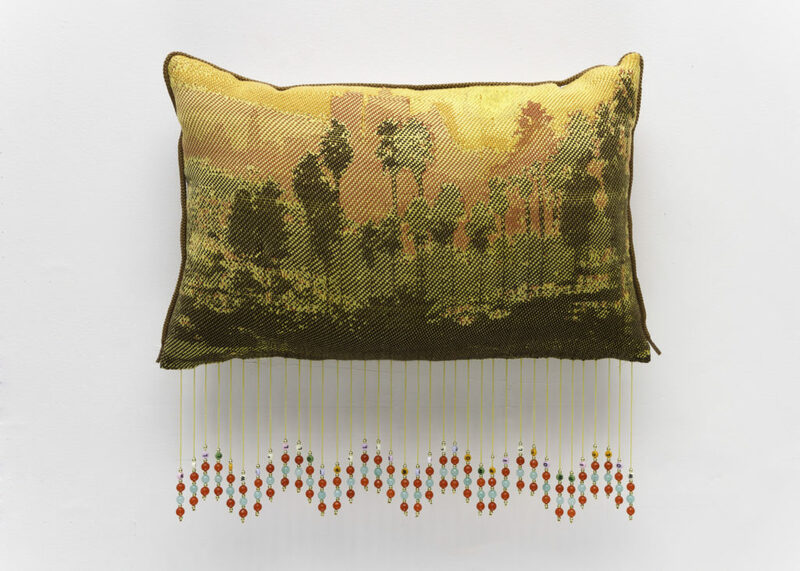 It’s a pillow embroidered with a washed-out scene depicting a stand of trees and, somewhere in the far distance, the murmurs of a city. Oscillating waves of beads that spell out “PILLOW” dangle from the pillow, capitalizing on the piece’s what-you-see-is-what-you-get attitude. It hovers between campy and ordinary, raising questions of what gets to be art and what gets relegated to the bargain bin at Goodwill. The difference between the two realms is not, in this case, an aesthetic distinction. Striking woodcut pieces by Dan Gunn share wall space with Gnatowski’s art. 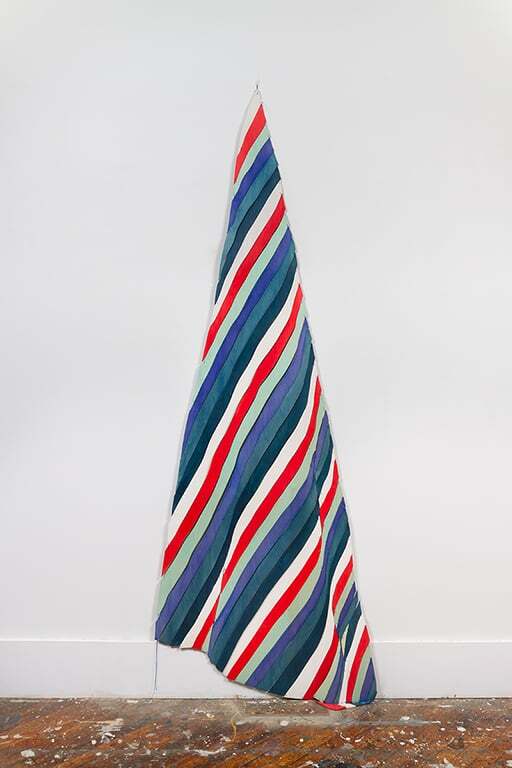 Made by tracing draped fabric in colorful wood, Gunn’s work puts you in the uncanny valley between firm and soft, movable and sturdy. His wooden draperies seems like they should sigh in the breeze and respond to your touch. 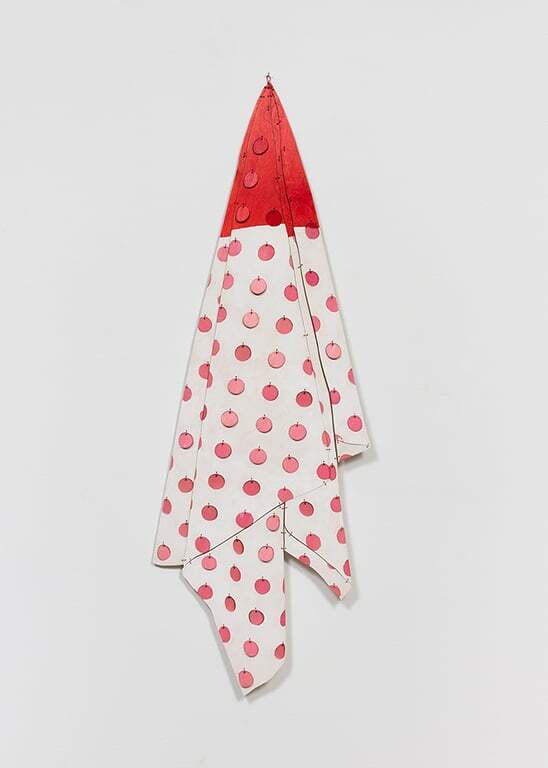 Turnover Setting, a small sculpture bedecked with polka dots, is especially striking in its folds, bold colors, and graceful arrangement. This almost comical ode to the lowly handkerchief highlights the way it’s often treated, left as it is to collect snot and the lint at the bottom of our pockets. Dan and Karolina’s work look fantastic together. They draw our attention to craftsmanship and form, to the anonymity of the people creating the objects we live our lives among. In the era of fast fashion and rampant consumerism and waste, we’re alienated from the specifics of our things: where do they come from, who makes them, and what happens to them when we’ve moved onto the next trend? Gnatowski and Gunn’s pieces force us to consider cloth quite literally at eye level: to contemplate what it’s made of and what it means, to treat it as more than just future fodder for the trash. The other two artists featured in Matter Matters are Alex Lockwood and Noël Morical. 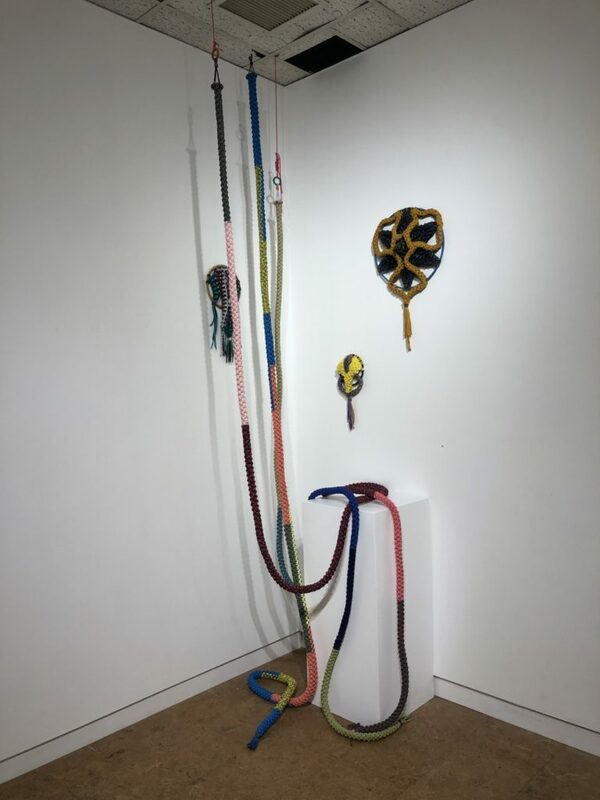 Both artists use unlikely materials — parachute cord in Morical’s case and a number of household and industrial objects in Lockwood’s — to create fibrous, tactile sculptures. Noël creates massive wall hangings and mounts using macraméed parachute cord, resulting in massive, colorful, and textural sculptures. Her pieces wind and undulate to create organic shapes and blobby masses, allowing us to think of parachute cord and its possibilities differently. 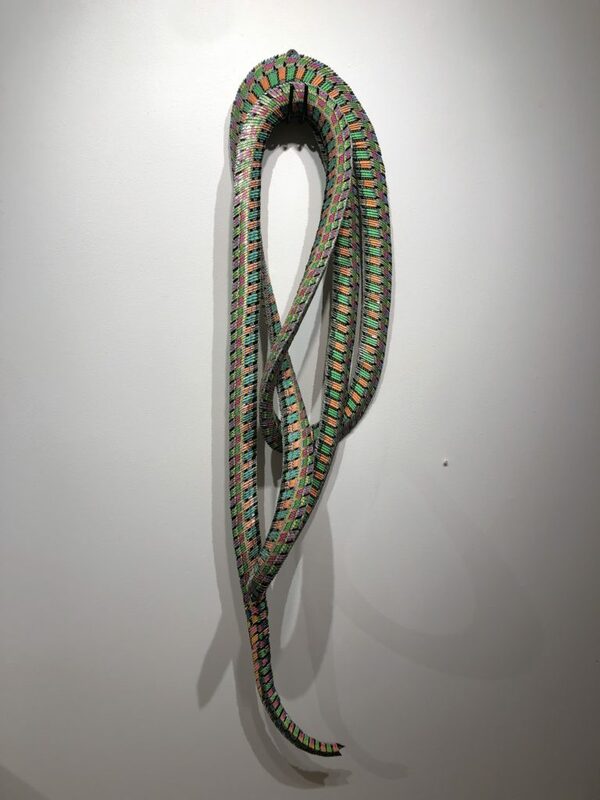 Morical’s piece display impressive craftsmanship: the thick parachute cord is expertly twisted and knotted, belying the work that went into it. Her long thick ropes are especially satisfying: thick chunks of fabric, big knots. Spiraling down from the ceiling, they feel sturdy, bold. Assorted Noel Morical pieces, photo my own. I was disappointed that Noel’s pieces are for the most part all stuck in one corner of the show — their placement makes them hard to consider individually, as they seem like disjointed pieces of an unbalanced whole rather than discrete works worth considering individually. 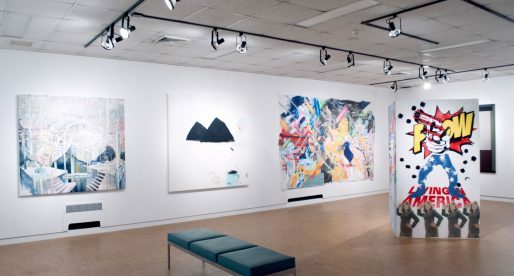 While I think the placement of her work doesn’t give the viewer easy access to the details in her pieces, it does raise questions about parts vs. whole, and how we choose to categorize things — a callback to gestalt themes running through the exhibit. Alex Lockwood, photo author’s own. Alex Lockwood’s art is similar to Morical’s in that Lockwood creates sculptures from unlikely objects, exploring what can be done with ubiquitous things. 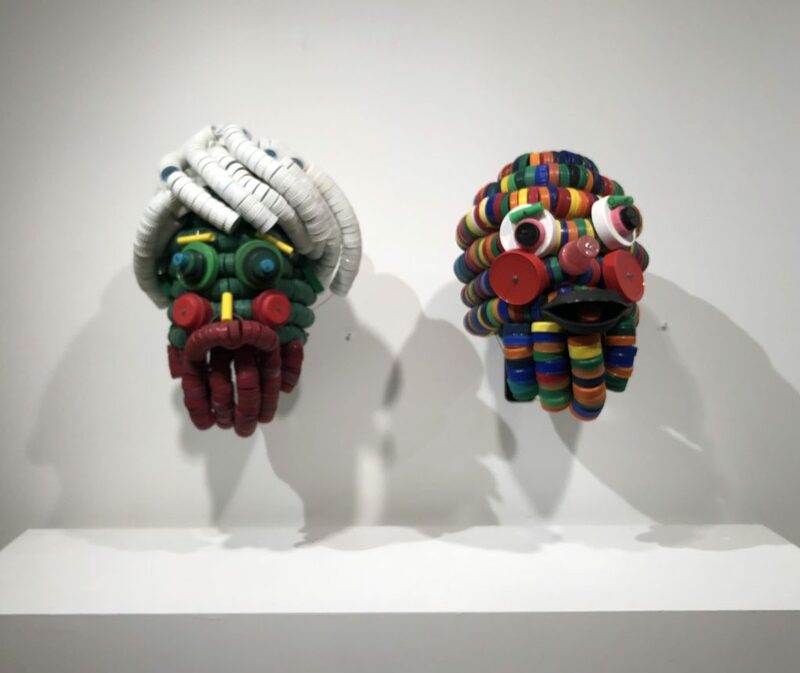 Bottle caps, lottery tickets, bullet casings, and more are pieced together to create masks, ropes, and the figure of a person. Lockwood’s pieces can be seen as exploring how the objects surrounding us create our identity, the things we use and touch becoming the filter the world sees us through. His art can also be seen as an invective against the mass quantities of stuff we create and thoughtlessly consume, with no mind paid to the work that goes into its creation or the consequences of its production. Whether Lockwood’s message is as proscriptive or as hopeful as Isaiah’s remains to be determined. 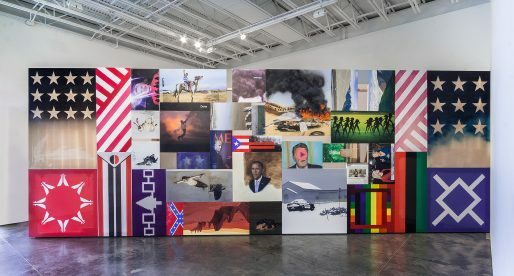 It seems more likely that Lockwood’s work is a kind of black comedy, reflecting the artifacts of the everyday violence we commit against people and nature in the name of convenience through a funhouse mirror. Lockwood and Morical’s pieces both explore unlikely uses for ubiquitous objects, especially objects that often facilitate violence, while Gnatowski and Gunn focus on ways to reimagine fabric and its presence in our lives. All four artists are discussing the things around us that we don’t examine, however, and the possibilities that lie in the objects we overlook. They’re also all reveries on the violence inherent in anonymity and mass production: the disappearing worker, the disappearing self, the disappearing world. Matter Matters as a whole is a colorful reflection on the life of materials from creation to eventual end. This show explores a number of ways that small and ordinary make up our lives as well as the nature of making and consumption. It’s a meditation on the small and the large, on violence and beauty, on light and dark, on fragments and wholeness.